Stilt fishing is a centuries old fishing method found only in Sri Lanka; following the footsteps of their ancestors, this group of Sri Lankan, found in a small town in Southern Sri Lanka called “Koggala” will bring their own stilts, tread to water that is 8-10 meters away from shore and hope to catch small fish that is only about 5cm in size. Sri Lankans tend to follow their family’s footsteps in the means of life; if the father is a stilt fisherman, the son will become a stilt fisherman, so on and so forth. However, because of the hardship of stilt fishing, there are maybe around 200 or so stilt fishermen left in Sri Lanka. Stilt fishing is no easy feat, the fishermen will sit on a small wooden plank of the stilt and wait for the catches; if the weather and wave patterns are favorable, they could capture as much as 5KG worth of fish in a day. Because of the big waves and shallow water, junks and speedboats will not be functional, especially when you compare the cost of a bamboo stick to a junk boat. Stilt fishing has practically been wiped out because of the Tsunami that smashed across East Asia, but the trade has slowly returned. 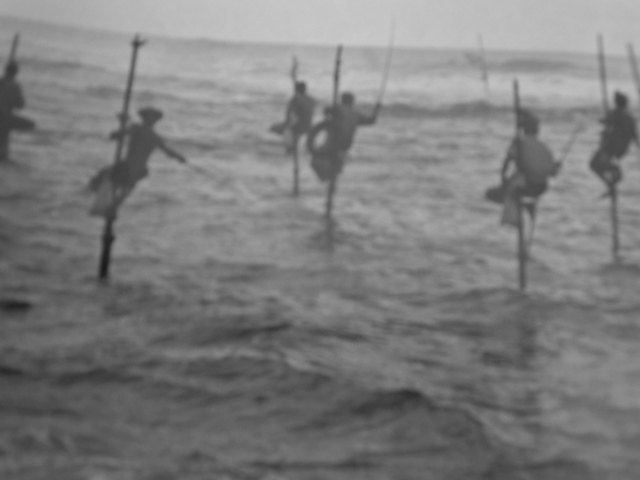 While stilt fishermen could be found in Koggala, they do not work everyday; especially during monsoon seasons or when the weather and water flow are not favorable, then they would usually rest.